We’re thrilled to announce that we’ve been named a strategic partner for Shopify Plus, which is Shopify’s commerce offering for high-growth, high-volume merchants! Shopify selected us due to our experience with developing and managing high-performing digital channel strategies to drive reach, engagement and sales for ecommerce merchants. And we chose Shopify Plus because it’s an extremely flexible and reliable platform that allows merchants to focus on growing their business through digital marketing initiatives, rather than forcing them to deal with IT. Think of it as a match made in the heavens. Something that was foretold in the stars. 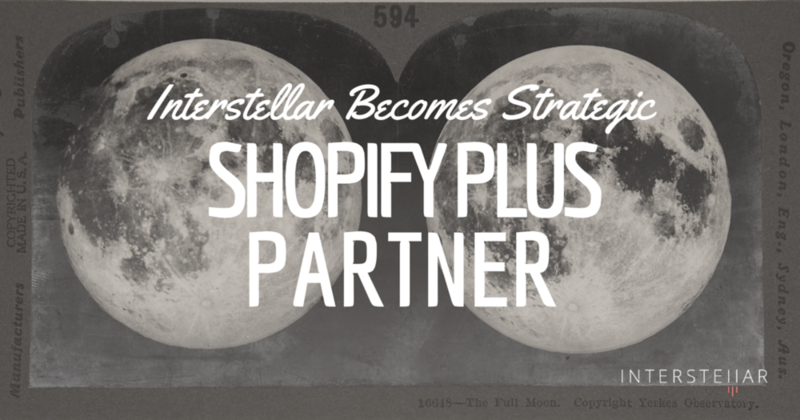 There is a mutual fit for the visions of our two companies and we couldn’t be happier to be a part of the new Shopify Plus Partner Program. One of the neatest things about Shopify Plus is that it allows the merchants and marketers to focus on the things that are truly important to the overall success of their business. In short, Shopify Plus was designed to eliminate the headaches and hassles associated with managing technologies. Instead of worrying about uptime, trying to integrate other operational software, or discovering numerous hidden fees, Shopify Plus provides the intuitive, powerful and reliable infrastructure for a low monthly fee. The new Shopify Plus Partner Program will develop and grow the partner ecosystem for Shopify Plus merchants, allowing them to more easily identify, validate and engage effective and innovative digital marketing and design agencies. It’s basically a win-win-WIN. Some of our favorite features are the fact that Shopify includes all the technical and structural elements necessary for optimal organic search visibility, which allows our SEOs to focus on improving keyword and content performance. Another favorite feature is the native ability to sell on third party channels and on social media platforms. These are just some of the many benefits that Shopify Plus offers merchants. If you’d like to learn more about Shopify Plus, and find out if it’s a good option for your business, simply fill out the form here and we’ll be in touch shortly. If you’re currently on the Magento platform, you should also know about their promotion for six months free service and free data migration if you switch to Shopify Plus. Pretty sweet deal, right? Don’t miss out on it. Drop us a line today!